"I was thinking his back was the national championship. I wanted it really bad. I felt I was so close." - Stanford's Chris Derrick, talking about the final straight in the men's 3000m at the NCAA Championships where he finished .17 seconds behind Lawi Lalang, one day after finishing 1.7 seconds behind Lalang in the 5000m. Am I the only one who saw Centro getting smoked coming? Cheserek and Burcham chase SUB-4 tomorrow!!!! 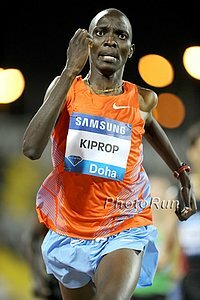 LRC Saturday: Iguider Wins Thrilling Men's 1,500m As Centro Fades To 7th, Genzebe Dibaba Lives Up To The Hype, Ashton Eaton, Sanya Richards Ross, Chaunte Lowe And Justin Gatlin (Uh) Get Gold World Record And $90,000 For Eaton A tremendous day of action and a good one for the USA. We break it down, including the men's 1,500m, where Abdalaati Iguider ruined the coming out party of Ilham Tanui Özbilen in an exciting race that saw Matt Centrowitz challenge for the lead. Genzebe Dibaba dominated the women's 1,500, showing she's the real deal. Plus Sanya Richards Ross, Chaunte Lowe and Justin Gatlin are all back from various ailments, some self inflicted, some not. Not to mention a super-tight long jump and a gold by a 39-year-old married to a former heroin dealer. AM: Men's 800m Semi Michael Rutt Makes Final A fall in Rutt's heat shook things up and he took advantage. Interview with him to right. Full morning recap from Athletics Weekly here. Daily Mail Criticized Tiffany Porter for Switching Allegiances, Arranged for Zola Budd To Do It Instead of ambushing Porter shouldn't they criticize British citizenship procedures? LRC PM Session: Lagat Survives A Scare As Stellar 3k Final Is Set, Genzebe Dibaba Finds Her Event, Plus First 5,000-Point Pentathlon, And Ryan Whiting Joins 22.00m Club The men's 3,000m is the best event at these championships and heat 2 had some fireworks with the world leader Augustine Choge, Bernard Lagat and Mo Farah. Lagat had to run on the infield down the homestretch but he wasn't DQed and made the final. The Brenda Martinez train came to a screeching stop. In the pentathlon Natallia Dobrynska and Jessica Ennis put on a show with Dobrynska getting the World Record. In the shot, American Ryan Whiting won a fabulous competition. OTB: *Lagat Took a Step on Inside Will they DQ Him? *Ashton Eaton runs an unbelievable 6.79 60m, with a .277 RT! 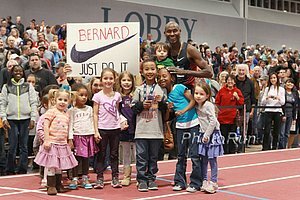 LRC Morning Session - Rupp Bows Out, Meet Ilham Tanui, Centrowitz, Erica Moore, Jackie Areson, Sara Hall Make Finals The World indoors got underway and the big event for LRC distance fans was the men's 1,500m semifinals. Galen Rupp drew unfavorable heat 1 and put up a game effort but did not advance, as Ilham Tanui arrived on the World stage and Matt Centrowitz advanced. All the other American distance runners except for Phoebe Wright advanced, as the women's 3,000m, women's 800 and men's 800 got going. 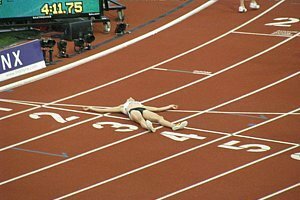 Jessica Ennis Devastated As She Loses Her World Title Due to a computer glitch after the 800 for a short moment she had thought she won and celebrated only to find out the true score seconds later. Mo Trafeh Three-Peats, Janet Cherbon-Bawcom Wins Title And Equalizer Bonus Molly Huddle was 2nd on the women's side and Christo Landy was second on the men's. More coverage here. Two-Time Boston Winner Moses Tanui Speaks Out Against Kenya Olympic Trials Being Held In Oregon "Is like staging national holiday celebrations in a foreign land." CAS Case On BOA Bylaw To Start Monday Sports lawyer who helped LaShawn Merrit overturn his Olympic ban predicts BOA will lose. *Jelimo's Agent Says Watch Out - She's Hungry Again "After sitting out and seeing her career degenerate she has found the hunger to win again. It was all in her eyes, even though she did not win in Lievin on Tuesday, you could see that she gave it all. A clear sign that she is back in the frame to compete. I tell you she will be in her best form when we head to May." *A Look At The Ethiopian Women's Chances Genzebe Dibaba and Meseret Defar are the favorites at 1,500 and 3k as Defar goes for a record 5th straight gold. Sprint News: Veronica Campbell-Brown Declares, "I'm ready!" *Dayron Robles Hurts Back, Pulls Out Of World Indoors Nothing too serious, a pulled muscle of some sort and says he should resume training next week. Craig Mottram Says He'll Have To Go Sub-13 To Make World Indoor 5,000 Final We're not sure if the author was sloppy or what, but there is no 5,000m at World Indoors. Mottram will have to run the 3,000m. 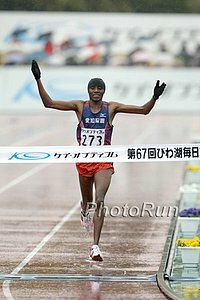 Kenya's Samuel Ndungu Debuts With 2:07:04 For The Win as Japan's Ryo Yamamoto Has Huge 3+ Minute PR To Grab Olympic Spot Henryk Szost got the Polish NR with 2:07:39 and Ryo Yamamoto was the first Japanese in 2:08:44. The Japanese had 2 sub-2:09s, 5 sub-2:10s, and 7 at sub-2:10:06 in this race. IAAF Lake Biwa Recap - Japanese Olympic Spot Decided On Track In the last 5km, 3 different people possessed the all-important "first Japanese" title and Ryo Yamamoto didn't pass Hiroyuki Horibata (7th at 2011 WCs) until they were on the track in the stadium. "I was just chasing and chasing," Yamamoto said. 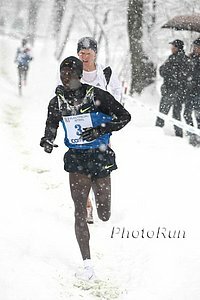 "I was not ready to run with the leaders when the real racing started at 25Km, so I decided to run my race and was just hoping that the leaders would come back to me. 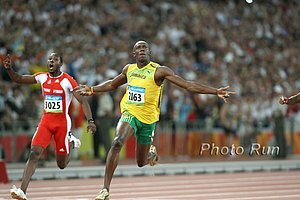 When I was getting closer (to the Japanese in front of me) I kept on chanting 'Olympics, Olympics' in my heart and kept on pushing." 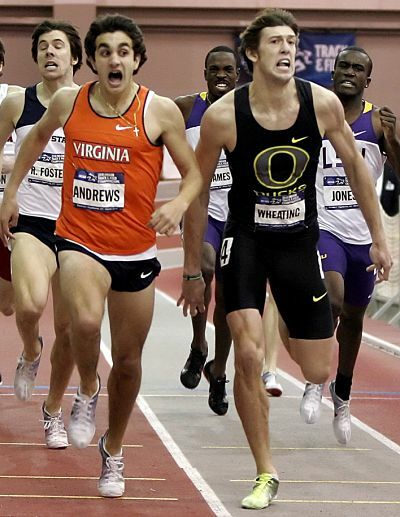 LRC Robby Andrews Leaves UVA Track Team LetsRun.com has learned that the two-time NCAA champ's incredible NCAA career at the University of Virginia has come to an end. 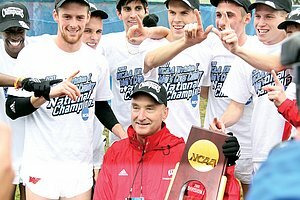 What a career it was - bookended by NCAA titles. 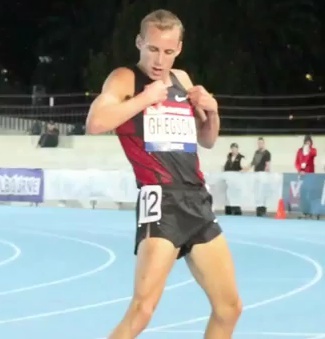 It started with an epic .01 win over Andrew Wheating and ended with an epic 1:44.71 - .04 win over Charles Jock. Andrews has not officially gone pro, but that seems to be the likely next step. MB: Robby Andrews No Longer Running for UVA *Is There Any Chance Robby Andrews Transfers? *Robby Andrews to Oregon Project? *Haile Says "I could run another marathon in two weeks." *LRC Favorite Yuki Kawauchi Disappointed With 14th Place/2:12:51 Showing Kawauchi: "If you're not good enough to be internationally competitive then you don't need to go to the Olympics. I tried, and it's over. Selection is based on results, and I do not think I will be picked." LRC 3ks Chris Derrick Pushes Lawi Lalang to the Line, Emily Infeld Wins Her First Title (link fixed) Friday night, Chris Derrick won accolades for coming within 1.7 seconds of beating Lawi Lalang. Derrick did even better on Saturday night coming within .17 seconds. In the end, Derrick's efforts weren't enough as Lalang completed the double. In the women's 3000m Emily Infeld won a four sprint around the final bend over among others Jordan Hasay. 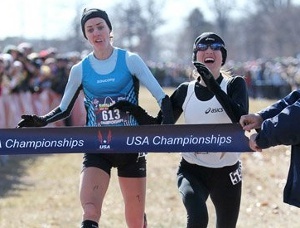 Hasay's Ducks were so good they would have won the team title if she had stayed in Oregon. LRC Mile, 800 and Team Recaps: Chris O'Hare Goes Wire to Wire, Jordan Hasay Tries To, Mason McHenry Surprises in 800, Nachelle Mackie Gets Another BYU 800 Win, Oregon, Florida Three Peat After beind edged out last year, Chris O'Hare went wire to wire to win the mile, while Jordan Hasay tried to go wire-to-wire but just came up short. In the 800s ASU's Mason McHenry showed what running your best when it matters can do for you, and Nachelle Mackie made it two years in a row for BYU wire to wire victories. In the team competition Florida three peated thanks to Jeff Demps (60m three peat), Tony McQuay (45.77 400) and Omar Craddock (triple jump win). Oregon three peated on the women's side and was led by Jordan Hasay's 11 points, and English Gardner winning the 60 and Brianne Theisen the pentathlon. Why wasn't A&M dq'd in the 4x4 ? Beach Wins Hep with 6138 points and 2:23.63 1000! Day 1 Recap Of NCAAs From Associated Press Arkansas freshman Andrew Irwin got a big win the pole vault and TCU's Whitney Gibson tied the NCAA record in the long jump. LRC NCAA Men's Preview: Can Anyone Stop Lalang? Who Wins The DMR? Can Miles Batty Hold Up As The Favorite In The Mile? What Happened To The 800? LRC NCAA Women's Preview: Will Hasay Have The Same Magic She Had Last Year Or Will A New Star Like Emily Infeld Or Katie Flood Arrive? Who Wins The Loaded 3,000? Can Lucy Van Dalen Hold Up As The Favorite In The Mile? IAAF HOF Members Section Go here to read bios on first 12 members. 12 more will be added this year. Five Americans Named To Inaugural IAAF Hall Of Fame Jackie Joyner-Kersee, Carl Lewis, Edwin Moses, Al Oerter and Jesse Owens among the initial 12 members. A Rundown Of Initial 12 In additon to the Americans, includes Abebe Bikila, Paavo Nurmi, Emil Zatopek, Adhemar da Silva, Fanny Blankers-Koen, Betty Cuthbert and Wang Junxia. TrackFocus: Why Was Suspected Drug Cheat Wang Junxia Elected To IAAF Hall Of Fame? "I strongly disagree with their decision. When you're thinking with your pocketbook or have your head completely in the sand, I can see how the IAAF might have come to this choice." 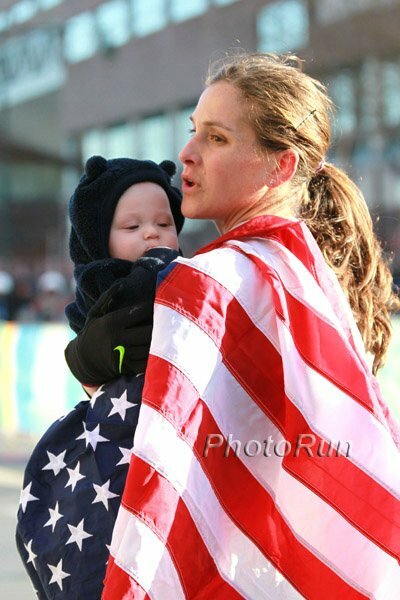 Brief Chat: Julie Culley, Who Will Run Her Debut Half Marathon At NYC Half She's ran on multiple World Championships teams and has a 15:21 5k PR. NYRR Debate: A Half Marathon In The Olympics? 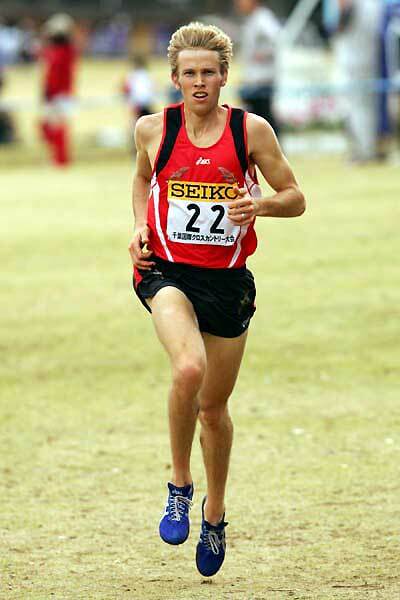 Good Interview With Dathan Ritzenhein Ahead Of NYC Half On the marathon trials he said, "Even with 200 meters to go, I really was still thinking that (I could get him) ...The distance was shrinking so fast that I didn't really ever give up hope until after the finish line." Fashion Blogger Declares 5 Of 6 Hottest Female Athletes In World Are Track Athletes He uses some retired ones like Amy Acuff. After Losing Lottery Funding, British HJer Robbie Grabarz Was Willing To Make An Olympic "Sacrifice" And Live Off His Credit Card "You're prepared to make any sacrifice possible. I had a credit card I was happy to live off until the games," said Grabarz who probably won't need it now that he's gone 2.34 indoors. 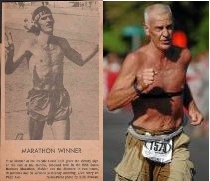 Bring Back The Mile: Ritz Still Wants A Sub-4 Mile Ritz reveals that he NEVER has run a mile in his life. Shocking. 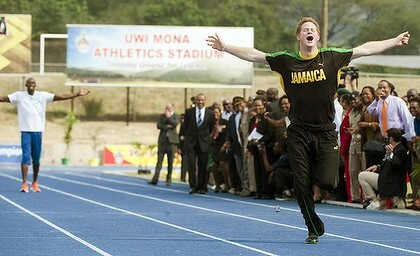 The 1,600m should be abolished. We can see some rationale people have for running 1,500 but none for 1,600m. And Meb Keflezighi also does not have a sub-4 mile. 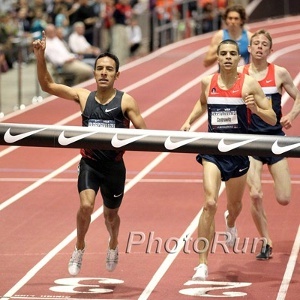 Leo Manzano Brief Chat: Bring Back The Mile, Winning USAs, The Manzano Mile And More He's running his own Manzano mile later this month. We wish Nike icentivized him to run World Indoors, but London is what matters. 70-Year-Old Japanese Man Qualified For Olympics In equestrian, not marathoning. We do have one question - how old is the horse? World Record For Yelena Isinbayeva (Updated) In case you wondered, Yelena Isinbayeva is fully back as she went 5.01 for the world record. Asked whether anyone could beat her this year, she said, "I think you can answer that question yourself," in reference to her 29cm winning margin. 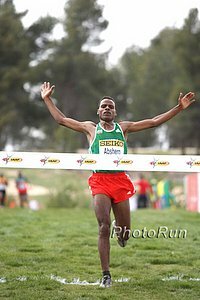 Isiah Koech won the 3k over Dejen Gebremeskel, Caleb Ndiku and 7:29.94 man from earlier this year Augustine Choge. Morgan Uceny ran 4:08 to get a close 3rd in the 1,500m as Anna Pierce struggled again. *"Yelena Isinbayeva Is At Her Best When Challenged"
*Start Lists Edward Cheserek listed in the mile, 2 mile, SMR, and DMR. LRC The Amazing People Who Are The Final Winners Of The LRC Puma Faas Challenge The final winners in the LRC Puma Faas Challenge whom you helped us select are simply amazing. We've got Olympic Trials runners, a guy with incurable cancer who just wants to run 16-minute miles, a guy who hit by car going 35mph while running and still wants to break 4:00 in the mile, Nick Symmonds' college teammate, a guy who has run 50,000 miles and never run in Pumas, a 69-year-old who won marathons in the '60s, '70s, and '80s and made the 1980 Olympic Marathon Trials, a former LetsRun.com cult hero, and a woman who has a 5-year running streak going that includes two pregnancies and two births. Crazy Unbelievable people. Puma wanted to prove its Faas line is for hard-core runners and what better way to do it than give away 100 pairs of shoes to put to the test. 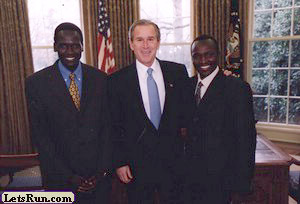 LRC Week That Was: USA Indoors, Your Top 50 Hopefuls For The Olympic Trials, Geb, Geb And Geb, Kawauchi, Peter Rono's Son, And Some New 800m Talent We span the globe to give you insight into the running world. If you want to know what is going on, click through. If you want to be uninformed, don't. Plus learn about the proprietor of Johnsonrunning.com. San Diego Tribune On Eamonn Coghlan's World Record In Indoor Mile 31 Years Ago We can give this the attention it deserves after this weekend's action.